In Philadelphia, it’s difficult to walk a few blocks without seeing one of the city’s many murals. One artist about to make her mark is Candy Chang. In Philadelphia, it’s difficult to walk a few blocks without seeing one of the city’s many murals or mosaics on the side of a building or even spanning an entire city block. 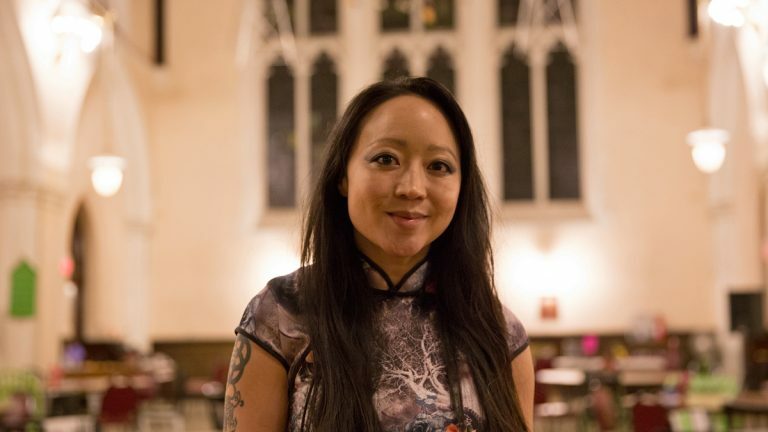 Now New Orleans-based artist Candy Chang is about to make her mark with a black-and-white surreal collage and interactive installation, in collaboration with the city’s renowned Mural Arts Program. Chang, with a background in urban planning, is interested in encouraging people to connect through a city’s shared and public spaces. She’s best known for creating participatory installations where she asks people to share a private or even intimate detail about their lives in a very public space. The collection of responses people share becomes the art and can reveal patterns and interesting finding about living in a city — or about one’s neighbors. 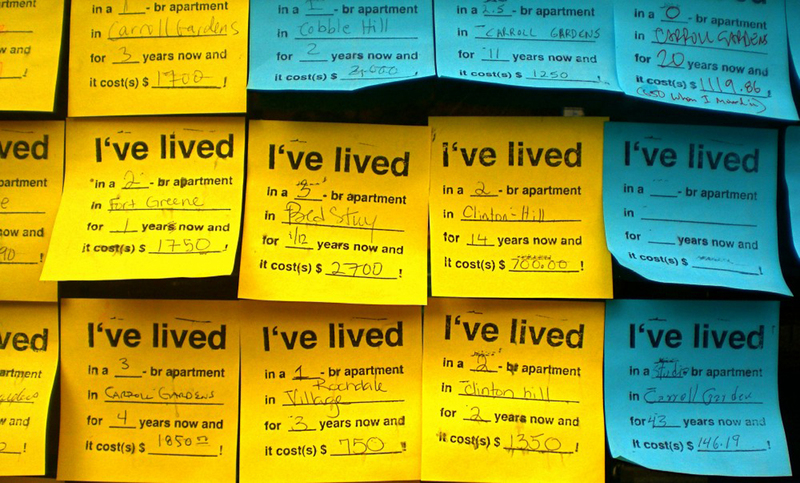 In Brooklyn, she asked residents to share how much they’re paying in rent on sticky notes displayed on a storefront window. Just by offering four basic pieces of information, residents old and new were able to show the range of housing costs in Brooklyn, for anyone to see. In Las Vegas, Chang asked people to step into a confession booth, like a religious ritual, and share a confession on a wooden plaque. She then presented the anonymous confessions on the walls of an art gallery. 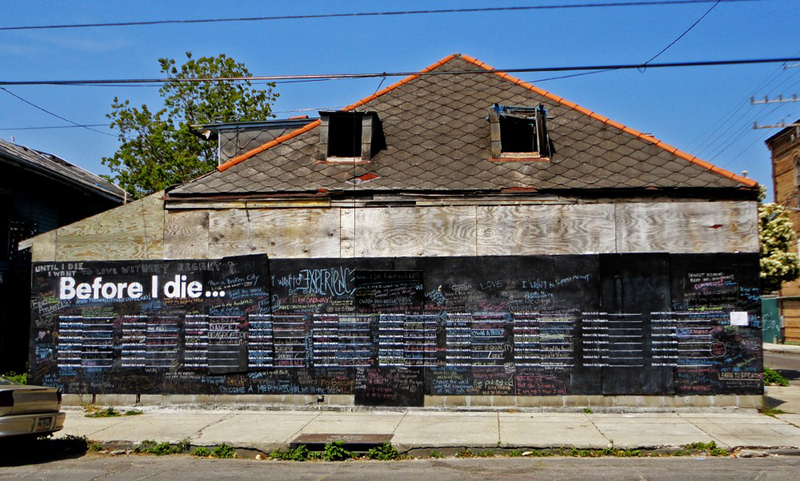 And in New Orleans, Chang painted a giant chalkboard on the side of an abandoned house, and invited people to respond to the prompt, “Before I die, I want to …”. Before I die, I want to hug a sloth. Before I die, I want to experience unconditional love. Chang said the core of the installation is the responses that people share, reflecting the joy, fear, gratitude, anxiety, and wonder you find in any community. 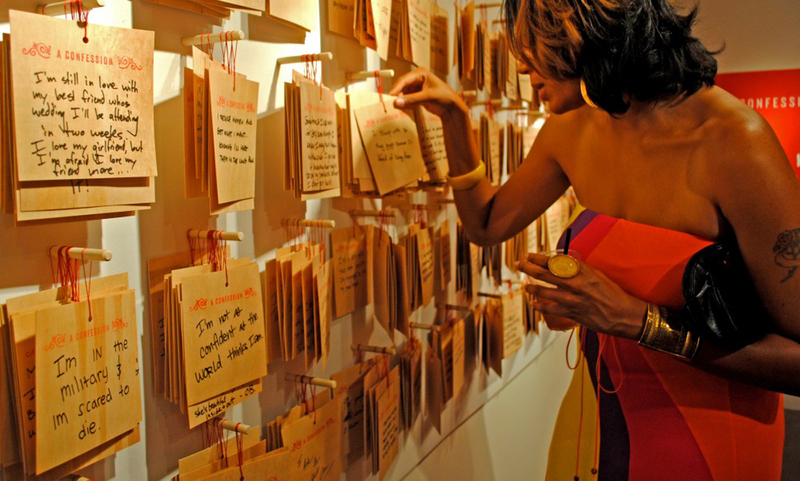 The “Before I Die” installation did not stop in New Orleans. Artists and community organizations from around the world replicated the chalkboard including in Pittsburgh and Philadelphia. In Reading, Pa., a group put their own twist on the “Before I die” wall and created a community chalkboard in front of a vacant lot that asked people to share what they love about Reading. In Philadelphia, Chang is taking on a different challenge by teaming up with the Mural Art’s Porch Light program, which focuses on addressing mental and behavioral health issues through public art. There are no fill-in-the-blank-prompts, chalkboards or sticky notes and it’s not a collection of neighbors’ thoughts, either. 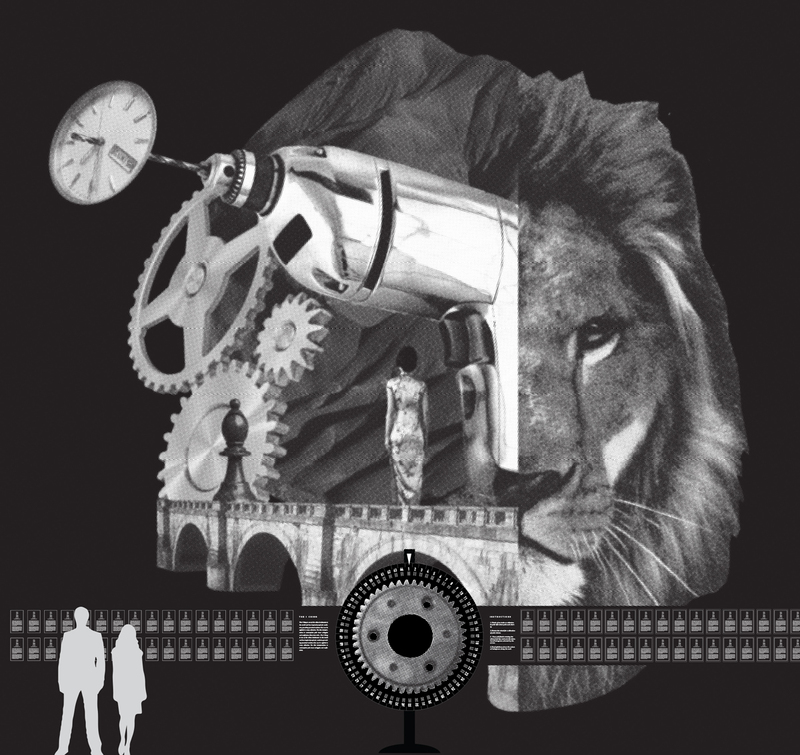 Inspired by the I-Ching and Carl Jung, Chang designed a surreal mural with 64 fables. People walking by will be prompted to think of a situation in their life where they’re seeking clarity and spin a giant dial on the wall. Depending on where the spinner lands, the dial will direct the person to read and reflect using one of the corresponding fables. Chang admits it’s a lot different than some of her other work, but that it will push the boundaries of what a mural might be able to do by offering tools in a public space to move beyond sharing consolations. 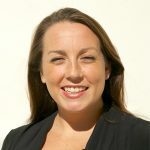 Laure Biron, Porch Light program director, said working with Chang seemed like a natural fit. The mural is expected to be completed in April 2016 at South and Juniper Streets.